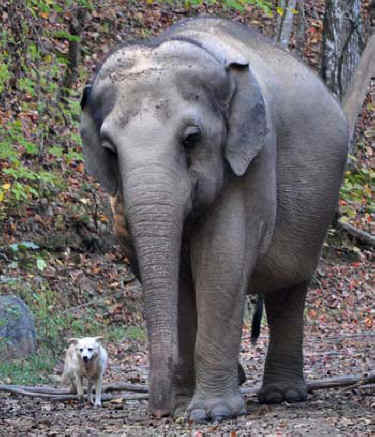 HOHENWALD, Tenn., Oct. 28, 2011—The Elephant Sanctuary in Tennessee announced today the passing of its beloved dog, Bella, treasured companion of The Sanctuary’s first elephant, Tarra. Bella, the little white stray who came to The Sanctuary in 2003, became one half of one of the world's most famous animal duos. "Tarra and Bella were utterly devoted to each other," stated Rob Atkinson, CEO of The Sanctuary. "They shared their lives together, often traveling miles each day exploring the 2,200 acres of their wilderness home here at The Sanctuary." The story of their friendship, in sickness and in health, was featured in 2009 on the CBS Evening News, bringing them worldwide recognition. Their story was subsequently shared on numerous other media outlets, including Oprah and People Magazine. "As soon as we realized Bella was missing on Tuesday morning, the staff launched a Sanctuary-wide search, which continued into the next day. Late Wednesday morning, Bella’s body was discovered close to the barn Tarra shares with Bella and five other elephants," recounted Steve Smith, Director of Elephant Husbandry. Dr. Scott, long-time veterinarian for Bella and all The Sanctuary’s animals, determined the cause of death. "Bella’s injuries show she was attacked by animals, probably coyotes." Samples have been sent for analysis to check whether other causes may have contributed to her death. Every effort was made to provide Tarra with the opportunity to allow her to come to terms with Bella’s death. "We expected Tarra to visit Bella, as elephants in their grief pay great attention to the bodies of their dead, but to our surprise Tarra stayed away," said Steve Smith. Further evidence surfaced that lead staff to believe that Tarra had many hours before become intensely aware of, and dealt with, Bella’s death in her own way. No indication of a struggle was found anywhere near where Bella was found, and based on the extent of her injuries it was clear Bella could not have reached the spot herself. Furthermore, examination of the underside of Tarra’s trunk revealed blood, the final evidence that pointed to the likely truth—that Tarra had found Bella during or after the attack and carried her body back to the barn. Rob Atkinson concluded, "I am convinced Tarra experienced the death of her friend that fateful night, brought her home and said her goodbyes. Tarra was a true friend to the end, and Tarra’s sisters and Caregivers will continue to take care of her, as she and Bella did each other." The Elephant Sanctuary was founded in 1995 as the nation’s largest natural habitat for Asian and African elephants. The 2,700 acres in rural Tennessee provides a forever home, where captive elephants can "just be elephants" and find sanctuary after lives in zoos and circuses. The Sanctuary has set up a Tribute page on its website to memorialize Bella with links to Tarra and Bella’s amazing story and recent photos of the two. Information on the creation of a Memorial Fund established in Bella’s honor, and the scheduling of a memorial service will be posted to the website in the coming days.